AISI 304 16-gauge Top Provide with 5 Hot 1/1 GN Pan and 1 Ambient 1/1 GN Pan. Top secured to TIG welded AISI 304 Angle Framework. 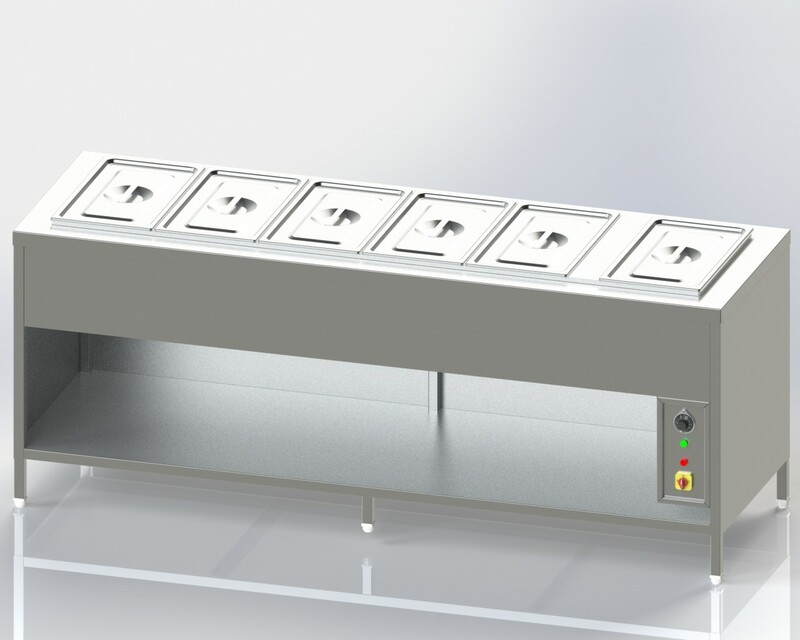 SS trough for Hot Bain Marie made from AISI 304 18 gauge with Ball Valve for releasing wastage water. For Heating Purpose use 3 KW Electrical Heater in Water Tank. Back Side provide control panel with Thermostatic Temperature controller and ON/ OFF Switch. Side Covering and U/S are made from 18 Gauge AISI 304. 4 Nos. Legs made of are 16 Gauge AISI 304 SQ. Pipe. Also available in Taylor made designs and sizes.